Diabetic nephropathy, Serum amyloid A, TNF-α, FN, UAER. Diabetes is a metabolic disorder caused by insulin secretion deficiency or other biological injuries, leading to persistently higher blood glucose concentration in the body . High level of blood glucose can cause dysfunctions of various tissues/ organs. Currently diabetic nephropathy (DN) has become the second popular cause for terminal nephropathy. With progression, the difficulty for treatment of DN is significantly increased . Therefore, studies on the DN pathogenesis/ progression are of critical importance for retarding and treating DN. Serum amyloid A (SAA) is a marker reflecting body inflammation. It is synthesized by hepatocytes and participates in body acute response . Previous study indicated that SAA might participate in the onset and progression of DN . In DN patients, minor-inflammation status is persistent due to high blood glucose level, in those with inflammation, SAA is further maintained at a high level . Such high level of SAA can stimulate the production of several inflammatory factors by various immune cells . On the other hand, SAA can also change body steroid metabolism, further aggravating the injury to renal vascular endothelial cells . Tumor necrosis factor (TNF-α) is a type of cellular inflammatory factor produced by activated macrophage, NK cells and T lymphocytes. In blood samples of DN patients, TNF-α level was significantly elevated , indicating possible relationship between TNF-α and onset/ progression of DN. Fibronectin (FN) is an important component of extracellular matrix (ECM). By studying renal tissues of DN patients, it is found that FN could induce the aggregation of ECM, leading to development of glomerular sclerosis . Therefore, this study aimed to investigate the effect of SAA in DN progression and possible mechanism. A total of 188 type II diabetic patients (96 males, 92 females, average age=56.2 ± 10.3 years) were admitted in the affiliated traditional medicine hospital of southwest medical university based on type II diabetes diagnostic criteria by WHO . All included subjected had no acute infectious diseases, malignant tumors, acute immune disorders or other renal diseases within one week before recruiting, nor did the usage of drugs that may affect renal function. Another cohort of 62 healthy adults (31 males and 31 females, average age=52.2 ± 11.5 years) were recruited as the control group. This study is under supervision by the affiliated traditional medicine hospital of southwest medical university ethical committee. All patients have signed informed consents. Urea micro albumin levels were measured in all 188 type II diabetic patients by model 7060 automatic biochemical analyzer. Patients were further divided into three groups based on the urinary albumin exercise rate (UAER), including pure diabetic group (with UAER ≤ 20 μg/min, N=64), microalbumin urea level (20 μg/min ≤ 200 μg/min, N=61) and those with UAER higher than 200 μg/min were classified into clinical albumin urea group. Peripheral blood samples were collected from all subjects. Serum was separated for analysis of the SAA and TNF-α levels by ELISA kits. In brief, 100 μL serum samples were added into pre-coated 96-well plate. 100 μL PBS (pH 7.4) was then added for 4°C overnight incubation. 2% H2O2-ethanol was then added to block endogenous peroxidase activity, with adding 1% BSA solution for blocking non-specific binding sites. After PBS rinsing, 1:1 000 diluted mouse antibody targeting SAA or TNF-α was added for 2 h incubation at 37°C. After washing out excess antibody, 1:200 diluted biotinlabelled goat anti-mouse secondary antibody was added for 37°C incubation (1.5 h). With excess secondary antibody washing out, OPD developing buffer was added for 6min reaction, with addition of 0.2 mM H2SO4. A microplate reader (Biotek) was used for measuring the SAA and TNF-α contents . Renal glomerular cell line 4200 was purchased from Cell Bank, Chinese Academy of Science (China). Cells were cultured in MCM4201 medium (Sciencell) containing 10% fetal bovine serum, 500U penicillin, 500U streptomycin (Hyclone) . Cyro-preserved cells were resuscitated and digested by trypsin for passage in 6-well plate. Cells were divided into four groups: control (adding 5.5 mmol/L glucose and 24.5 mmol/L mannose), high-glucose group (adding 30 mmol/L glucose in the medium), high glucose+siRNA group (adding 30 mmol/L glucose in the medium) and high glucose +negative control group (adding 30 mmol/L glucose in the medium). mRNA sequence of SAA (Genebank access number: NM_001664) was used to design sequence for RNA transfection. Anti-SAA fragment and negative control sequence were synthesized by chemical methods. All bases in the sequence were modified by adding methyl group. Nucleotide sequence was synthesized by Sangon (China) as shown in Table 1. Liposome INTEREFER in transfection kit (Polyplus transfection) was used for cell transfection assay. Table 1. Nucleotide sequence for cell transfection. PCR primers were designed based on mRNA sequence of SAA (Genebank access number: NM_001664), with sequences shown in Table 2. Relative expression level of SAA mRNA in all samples was measured using β-actin as the internal reference. Tissue RNA fast extraction kit (Qiagen) was employed to extract total RNA from cells. RT-PCR kit (TianGen) was used for performing RT-PCR assay. Reverse transcription PCR was firstly performed under 37°C for 2 h. cDNA produced by reverse transcription was then used as the template for RT-PCR under the following conditions: 95°C for 5 min, followed by 30 cycles each containing 95°C 1 min, 58°C 30 s and 72°C 1min. PCR products were tested using 1% agarose gel electrophoresis. A gel imaging analyzer was used for calculating the relative mRNA expression level of SAA . Cultured cells were separated by centrifugation and were homogenized in liquid nitrogen. Cell lysis buffer (pre-colded) was added for lysing cells at 4°C overnight. The mixture was then centrifuged at 12000 rpm for 10 min to extract the supernatant for SDS-PAGE analysis. Total proteins were extracted and separated in SDS-PAGE containing 15% separation gel and 5% condensing gel. Proteins were then transferred to PVDF membrane for 37°C blocking for 1 h. After TBST washing, primary antibody working buffer (for SAA or TNF-α specific mouse antibody) was added for 4°C overnight incubation. TBST was used to wash out excess primary antibody, followed by addition of horseradish peroxidase (HRP) labeled goat anti-mouse IgG secondary antibody (1:1000) for 1h room temperature incubation. After rinsing in TBST, the membrane was developed in DAB chromogenic substrate for 10 min, with distilled water rinsing to quench the development. Western Blot images were captured by computer assisted system for analyzing integrated gray value of target bands . At 0 h, 12 h, 24 h and 48 h after transfection, cell culture medium supernatant was collected for detecting FN protein secretion by ELISA. Primary antibody used was FN specific mouse antibody. ELISA was performed as described above. Using culture time as the horizontal axis, and FN concentration as vertical axis, a curve was plotted to analyze the difference of FN secretion after transfection. Data statistics was performed by SPSS20.0 software. All data were presented as mean ± standard error (SE). Analysis of variance (ANOVA) was used for comparison of the differences among multiple groups. Pearson correlation was employed for correlation analysis. A statistical significance was defined when p<0.05. All subjects were divided into pure diabetic group, minor albumin urea group and clinical albumin urea groups based on 24 h UAER. ELISA was used to detect serum SAA and TNF-α concentrations in all groups and results were shown in Table 3. Results found significantly elevated serum SAA and TNF-α level in minor albumin urea and clinical albumin urea groups compared with control or pure diabetic patients (p<0.05). In clinical albumin urea patients, serum SAA and TNF-α concentrations were further significantly higher than minor albumin urea group (p<0.05). Pearson correlation analysis found positive correlation of serum SAA or TNF-α levels with UAER in diabetic patients (r=0.463 and 0.278, respectively, p<0.05). Note: *p<0.01 compared with control group; #p<0.05 compared with pure diabetic group; &p<0.05 compared with minor albumin urea group. Table 3. Serum SAA and TNF-a level in diabetic patients. To evaluate the effect of SAA gene expression on glomerular cells, we transfected in vitro cells using RNA interference approach to suppress SAA gene expression in glomerular cell line 4200. RT-PCR tested SAA mRNA expression in renal glomerular cells after transfection and showed significantly decreased SAA gene expression in anti-SAA transfected glomerular cells than that in control group (p<0.01, Figure 1), indicating successful RNA interference for suppressing SAA expression. 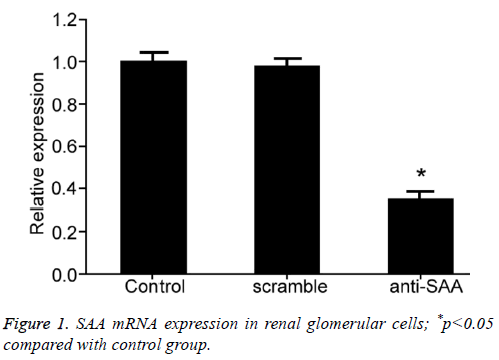 Figure 1: SAA mRNA expression in renal glomerular cells; *p<0.05 compared with control group. To test the effect of SAA expression on renal glomerular cells under high-glucose condition, we further divided glomerular cells into four groups: control, high-glucose; high-glucose + RNA interference; and high glucose+scrambled negative control group. After 48 h treatment, Western Blot assay was performed to measure SAA and TNF-α levels in different groups (Figure 2). Results showed that under high-glucose culture condition, glomerular cells had elevated SAA level, plus enhanced TNF-α concentration in supernatant in culture medium compared with control group, indicating that high glucose treatment can elevate SAA expression in renal glomerular cells, leading to increased secretion of TNF-α. Meanwhile, we found that RNA interference targeting SAA significantly decreased TNF-α expression inside cells (p<0.05). Figure 2: SAA expression and TNF-a concentration in renal glomerular cells. A) control group; B) high-glucose group; C) highglucose + RNA interference group; D) High-glucose + scrambled group. *p<0.05 compared with A; #p<0.05 compared with D.
By testing FN protein secretion in culture renal glomerular cells under different conditions, we found that those cells transfected with anti-SAA had no significant difference of FN secretion compared with control group (p>0.05). However, FN secretion was significantly down-regulated when compared to high-glucose or high glucose+scramble negative control group (p<0.05), indicating that SAA expression inhibition reduced FN secretion from renal glomerular cells under high-glucose conditions (Figure 3). Figure 3: FN concentration in glomerular cells after transfection. *p<0.05 compared with high-glucose group; #p<0.05 compared with high glucose+negative control group. Previous study showed minor inflammation status in most diabetic patients, with a high level of SAA . To study the relationship between high-level SAA expression and the progression of diabetes, we firstly classified diabetic patients into pure diabetic group, minor albumin urea and clinical albumin urea groups, in which serum SAA and TNF-α concentration was measured. We found significantly higher SAA and TNF-α level in minor albumin urea and clinical albumin urea groups compared with control or pure diabetic groups. Furthermore, correlation analysis found positive correlation of SAA or TNF-α level with patient UAER. As an early diagnostic marker for DN, UAER can reflect the abnormal leakage of proteins from kidney, with normal range being from 4.28 to 18.14 mg/g. Cr . In DN patients, injury of renal functions and lesion in renal internal vessels change the potency of kidney for filtering proteins especially albumin, leading to leakage of proteins to urea. Therefore, UAER could be used as a marker evaluating the renal function and severity of DN [16,17]. This study found positive correlation of serum SAA or TNF-α level with UAER in diabetic patients, indicating the close correlation between the expression of these two proteins and DN severity or renal dysfunction conditions. Synthesized in hepatocytes, SAA can bind to HDL to facilitate release of free cholesterol from tissues and increase of blood levels . Abnormally elevated blood lipid facilitates activation of coagulation mechanism, thus damaging renal glomerular cells, enhancing permeability of glomerular basal membrane, causing more protein leakage. On the other hand, it also impedes micro-circulation of renal vessels, eventually causing kidney dysfunction as the result of focal hypoxia . This study also revealed elevated serum TNF-α concentration in diabetic patients. Meanwhile, in vtiro cell assay also showed that high-glucose culture elevated the secretion of inflammatory factors TNF-α and ECM component FN expression in renal glomerular cells, possibly due to facilitated oxidation of LDL by SAA, which could elevate the expression of inflammatory factor and endothelial cell adhesion factor, eventually leading to proliferation of vascular smooth muscle cells. In addition, TNF-α up-regulation also aggravates inflammation, forming a viscous cycle to accelerate the impaired function of kidney [20-22]. On the other hand, SAA can directly activate MAPK protein to facilitate enlargement of renal glomerular cells, and increase ECM protein secretion, eventually causing sclerosis and fibrosis of renal glomerular structures. DN is a common complication of diabetes and also a second cause for terminal kidney disease. With timely diagnosis and treatment, such renal dysfunction can be reversed at certain extents . We further tested the correlation between SAA/ TNF-α and DN progression or renal dysfunction, aiming to provide some evidences for DN diagnosis and disease condition evaluation. Meanwhile, we also manipulated SAA expression level in renal glomerular cells to investigate the molecular mechanism of SAA in DN. This study indicated that SAA and TNF-α level could be used as a marker to evaluate the renal function of DN patients and disease progression. SAA concentration is probably correlated with DN occurrence and progression. High-glucose level can lead to increased secretion of ECM component FN protein and inflammatory factor TNF-α in glomerular cells, eventually leading to renal lesions. This work was supported by self-fund project of Luzhou Science and Technology Bureau (2013134) and self-fund project of Sichuang Science and Technology Deparment (2013SZZ007). Gerstein HC, Miller ME, Byington RP, Goff DC, Bigger JT, Buse JB, Cushman WC, Genuth S, Ismail-Beigi F, Grimm RH, Probstfield JL, Simons-Morton DG, Friedewald WT. Effects of intensive glucose lowering in type 2 diabetes. N Engl J Med 2008; 358: 2545-2559. Wada J, Makino H. Inflammation and the pathogenesis of diabetic nephropathy. Clin Sci (Lond) 2013; 124: 139-152. Marzi C, Huth C, Herder C, Baumert J, Thorand B, Rathmann W, Meisinger C, Wichmann HE, Roden M, Peters A, Grallert H, Koenig W, Illig T. Acute-phase serum amyloid A protein and its implication in the development of type 2 diabetes in the KORA S4/F4 study. Diabetes Care 2013; 36: 1321-1326. Overgaard AJ, McGuire JN, Hovind P, Parving HH, Rossing P, Pociot F. Serum amyloid A and C-reactive protein levels may predict microalbuminuria and macroalbuminuria in newly diagnosed type 1 diabetic patients. J Diabetes Complications 2013; 27: 59-63. Anderberg RJ, Meek RL, Hudkins KL, Cooney SK, Alpers CE, Leboeuf RC, Tuttle KR. Serum amyloid A and inflammation in diabetic kidney disease and podocytes. Lab Invest 2015; 95: 250-262. Grossmann V, Schmitt VH, Zeller T, Panova-Noeva M, Schulz A, Laubert-Reh D, Juenger C, Schnabel RB, Abt TG, Laskowski R, Wiltink J, Schulz E, Blankenberg S, Lackner KJ, Munzel T, Wild PS. Profile of the immune and inflammatory response in individuals with prediabetes and type 2 diabetes. Diabetes Care 2015; 38: 1356-1364. Tsun JG, Shiu SW, Wong Y, Yung S, Chan TM, Tan KC. Impact of serum amyloid A on cellular cholesterol efflux to serum in type 2 diabetes mellitus. Atherosclerosis 2013; 231: 405-410. Omote K, Gohda T, Murakoshi M, Sasaki Y, Kazuno S, Fujimura T, Ishizaka M, Sonoda Y, Tomino Y. Role of the TNF pathway in the progression of diabetic nephropathy in KK-A(y) mice. Am J Physiol Renal Physiol 2014; 306: F1335-1347. Tavafi M. Complexity of diabetic nephropathy pathogenesis and design of investigations. J Renal Inj Prev 2013; 2: 59-62. Harris MI, Eastman RC, Cowie CC, Flegal KM, Eberhardt MS. Comparison of diabetes diagnostic categories in the U.S. population according to the 1997 american diabetes association and 1980-1985 World Health Organization diagnostic criteria. Diabetes Care 1997; 20: 1859-1862. Morizane S, Mizuno K, Takiguchi T, Sugimoto S, Iwatsuki K. The involvement of serum amyloid A in psoriatic inflammation. J Invest Dermatol 2016. Ueno T, Kobayashi N, Nakayama M, Takashima Y, Ohse T, Pastan I, Pippin JW, Shankland SJ, Uesugi N, Matsusaka T, Nagata M. Aberrant Notch1-dependent effects on glomerular parietal epithelial cells promotes collapsing focal segmental glomerulosclerosis with progressive podocyte loss. Kidney Int 2013; 83: 1065-1075. Thaler R, Sturmlechner I, Spitzer S, Riester SM, Rumpler M, Zwerina J, Klaushofer K, van Wijnen AJ, Varga F. Acute-phase protein serum amyloid A3 is a novel paracrine coupling factor that controls bone homeostasis. Faseb j 2015; 29: 1344-1359. Krishack PA, Bhanvadia CV, Lukens J, Sontag TJ, De Beer MC, Getz GS, Reardon CA. Serum amyloid a facilitates early lesion development in Ldlr-/- Mice. J Am Heart Assoc 2015. Zurbig P, Jerums G, Hovind P, Macisaac RJ, Mischak H, Nielsen SE, Panagiotopoulos S, Persson F, Rossing P. Urinary proteomics for early diagnosis in diabetic nephropathy. Diabetes 2012; 61: 3304-3313. Ahmad J. Management of diabetic nephropathy: Recent progress and future perspective. Diabetes Metab Syndr 2015; 9: 343-358. Andresdottir G, Jensen ML, Carstensen B, Parving HH, Hovind P, Hansen TW, and Rossing P. Improved prognosis of diabetic nephropathy in type 1 diabetes. Kidney Int 2015; 87: 417-426.
de Beer MC, Wroblewski JM, Noffsinger VP, Ji A, Meyer JM, van der Westhuyzen DR, de Beer FC, Webb NR. The impairment of macrophage-to-feces reverse cholesterol transport during inflammation does not depend on serum amyloid A. J Lipids 2013; 2013: 283486. Carney EF. Diabetic nephropathy: cholesterol and podocyte injury. Nat Rev Nephrol 2013; 9: 493. Lee HY, Kim SD, Baek SH, Choi JH, Cho KH, Zabel BA, Bae YS. Serum amyloid A stimulates macrophage foam cell formation via lectin-like oxidized low-density lipoprotein receptor 1 upregulation. Biochem Biophys Res Commun 2013; 433: 18-23. Wu BJ, Chen K, Shrestha S, Ong KL, Barter PJ, Rye KA. High-density lipoproteins inhibit vascular endothelial inflammation by increasing 3beta-hydroxysteroid-Delta24 reductase expression and inducing heme oxygenase-1. Circ Res 2013; 112: 278-288. Sun L, Kanwar YS. Relevance of TNF-alpha in the context of other inflammatory cytokines in the progression of diabetic nephropathy. Kidney Int 2015; 88: 662-665. Brosius FC, Alpers CE. New targets for treatment of diabetic nephropathy: what we have learned from animal models. Curr Opin Nephrol Hypertens 2013; 22: 17-25.